iPhone Apps on Ulitzer - The Apple iTablet or iSlate is due to be shown off to the world January 27th, and unleashed on us sometime in March. The blogosphere has been buzzing about the topic. Joe Wilcox of BetaNews.com said “The world doesn’t need an Apple Tablet, or any other” (full post here). MG of TechCrunch followed up with “The World Doesn’t Need Someone Telling Us What We Don’t Need In Tech” (full post here). I think both writers make some good points, but I wanted to give my thoughts, and ask the readers of CTOvision theirs. The Apple Tablet is rumored to cost $1000. So the first word that comes to my mind is “overpriced.” When you can purchase a decent netbook for under $300, a solid ultra-portable 12-14″ (laptop) for $500, and a good business laptop for under $700…why would you ever pay $1000 for a simple tablet? Quite frankly, I doubt $1000 is a price that will be acceptable to mainstream consumers (it certainly isn’t to me!). Now I have never been a big Apple fan, I enjoyed an iPod (3rd Gen) for a while, until the battery wouldn’t last more than 20 minutes playing music, then switched to a Zune (pre-ZuneHD I am sad to say). I am what people call a “power-user” and have always been extremely frustrated by Apple’s DRM, proprietary formats, and proprietary software. I don’t think drag and drop quite fits the bill, but I would love to be able to assemble a simple playlist and easily drag it over player with it transferring, without having to use iTunes or Zune Marketplace/software. My fear for the Apple Tablet is that it will be riddled with proprietary Apple software and connections (DisplayPort? Flash-incompatible? ), instead of open source software and HDMI. 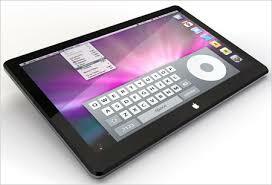 Rumors have surfaced stating that Apple plans to use their own processing chips on this project. If they do, I do not think it’s a good idea at all. NVIDIA has their Tegra line of CPU+GPU and Intel has the CULV processor (which is wonderfully paired with a NVIDIA Ion GPU for low powered goodness), which are both proven power-sipping solutions to the mobile computing/graphics producing questions. Does Apple really think that their chips are better at computing than Intel’s, or better at graphics than NVIDIA’s? All told, there is a HUGE market for tablets. Many have said as a living room computer – I couldn’t agree more. As well, as an e-book reader, I’ve used an Ubuntu tablet for this, and it’s great, just turn down the screen brightness (it is not as bad as Amazon/B&N would like you to believe). It would also be a great entertainment device, on airplanes (if we’re allowed to use them), on the bus, and around town. In my mind the biggest draw is for all day computing. Like netbooks, tablets need to be able to last the length of a day. I believe seniors would like good, touch sensitive tablets. A simple check of CES shows that there is a deluge of tablets coming our way, so how does Apple plan to differentiate (other than pricing in the stratosphere?). Quite frankly, I do not think that they can. I believe lots of Apple die-hard faithful will buy them, but I don’t think they will take off (like other tablets will). Of course this is all pure speculation, so leave your thoughts on the Apple Tablet below!